In recent years, investigations carried out during repair and restoration work have led to a significant increase in our knowledge of the techniques used in early plasterwork, but little is documented. Ian Constantinides examines the use of traditional lime plaster and explodes some popular myths and misconceptions. While the stylistic development of plasterwork through the ages is well documented, the history of pre-Victorian plastering technology is relatively little researched. Sources lack real detail on the craftsman's materials and methods of working. Millar's authoritative textbook, 'Plastering Plain and Decorative' is a bible to most, but is limited in that it describes state of the art lime plastering relevant only to Victorian and Edwardian work. In recent years, our understanding of this earlier work has increased considerably. While the conservation, repair and renewal of historic plasterwork has lagged behind that of stone, fewer horror stories are heard. It doesn't require a particularly sensitive eye to see how uncomfortably the skilled, but uniformly repetitious repair work of the fibrous plasterers compares with the original, in situ, hand work of an early Jacobean ceiling, and the wholesale replacement of solid plasterwork by fibrous plaster is now less common. But it is less evident how changing materials and techniques can effect the structural integrity of historic plasterwork. The addition of gypsum, for example, which sets rapidly on addition of water, radically affects the working time and consequently the decorative treatment, as well as the set itself. Gypsum is sometimes found in humble work of early date and is often not apparent where most expected. An exemplar was made for Uppark House in which a stiff lime putty-hair mix was rammed into solid moulds and released while still green. If there is any gypsum in the cast elements it is so small that it does not materially affect the setting. Once cast, the mouldings could be further worked or tweaked by hand to add definition, enrich details, or accentuate undercuts, and consequently each cast is slightly different. Runs of egg and dart or waterleaf made in this manner were often fixed whilst still green, and could deform to follow irregularities. The result is a liveliness and individuality which is entirely different from the disciplined craftsmanship evident at Prior Park also of the mid 1700s, where the cast elements were in poured plaster of Paris and each cast is identical. The work is of the highest quality, every bit as good, but very different in character. At Thirlestane and a number of other Scottish castles with ceilings by the same band of itinerant craftsmen, the frieze and cast enrichments are all in a well haired, lime rich mix (approximately one part of lime to a fifth part aggregate). They are gypsum free and so flexible that at Craigievar a cast is wrapped around a corbel with a radius of some 200mm. Despite the importance of doing so, only recently have real attempts been made to understand the nature of the material that is being repaired or renewed, and a number of significant changes in perceptions and attitudes have increased our understanding of the trade. Most significantly, it is now generally recognised that a mortar complying with British Standards has little in common with the materials used in our building heritage, and it is clear that currently accepted good practice in workmanship is often far removed from that which produced all the idiosyncrasies of the work we are trying to conserve. Mortar analysis is increasingly recognised as a key factor in the conservation programme, particularly at the pre-contract stage. Analysis of the original is best carried out as a separate pre-contract, prior to the development of a specification for the work, as the programme and financial implications of the main contract often prohibit thorough research later on. A few building conservation firms carry out their analysis in-house and the interaction between analyst, plasterer and historian is crucial. There is an increasing tendency to award pre-contract investigatory works to specialist firms, and as a consequence specifiers are increasingly confident and abandon many of the standard clauses and BS references in the specification of workmanship and materials that often result in bland and inappropriate work, however technically accomplished. Multiple pre-contract analysis has contributed significantly to understanding and dating building chronology. The analyst not only looks at the material's constituents, but is trained to interpret clues on techniques. Material types fall into contexts of geology, chronology and social change. The analyst will typically look for type and quantity of hair, its presence or absence in all coats including the setting, how the coats were scratched, whether they were scoured, how much they shrank on drying, whether shrinkage cracks were transmitted through the coats, and whether the coats were applied green on green, or green on dry. This information is ancillary to the analyst's prime interest in identifying and quantifying aggregate type, grading, and origin, lime binder to aggregate ratio, the presence of gypsum gauging, hydraulic additives and organic constituents such as oils, fats or glues. 'There is only one way to do it and that is the right way' is an often heard cry from craftsmen and specifiers alike. However as our knowledge increases through analysis and investigation, it is apparent that there are as many 'right ways' as there are buildings with historic plasterwork, particularly in pre-Victorian times. It is widely believed that proportions are ideally 1 part of lime to 3 parts of sharp washed pit sand for base coats and approximately equal parts of lime and silver sand for setting coats. However, analysis has shown that every permutation exists from pure lime plasters to pure clays. Aggregates vary from the coarse to the fine and from sharp to soft. Sands, as we understand them, are often not found at all. Binder aggregate ratios vary from lime rich to lime lean. Hair is sometimes not found at all, whereas elsewhere it may be present in such an abundance that sheets of plaster can literally be rolled up like a carpet without significant damage. Hair may even be found in setting coats. Surprisingly often analysts find fine, white (or coloured) hair well trowelled into the surface and almost invisible even when paint-stripped. Similarly it is often held that one should always try to make lime mortars hard. Indeed lime mortars can be scoured and polished with limewater to take an almost marble like finish, if required. However, it is often the weaker softer materials that survive longest. The soft, hairy clay or lime plasters can accommodate an almost extraordinary amount of structural movement, whilst their harder counterparts would have broken off in sheets. 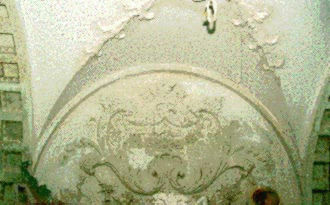 In cast work, screeds for the work and setting coats were not always gauged with gypsum. The use of gypsum seems to vary with locality, the client's wealth, the proximity of gypsum mines, and local practice, although of course its use became more prevalent in the 19th century as gypsum became more easily available. That coats are progressively thinner the nearer the surface. Whilst this is often true, there are exceptions. The Roman Baths in Bath dating from the early centuries AD have plasterwork of a total thickness of some 30mm, of which the top coat is 20mm thick. At Prior Park work of the early 19th century which appears to follow 'state of the art' good practice consists of a coring-out (first) coat averaging some 5-10mm thick whilst the finish varies between 20-35mm in one coat. In conclusion, plasterwork is probably the least defined of the trades. Understanding the materials, 'unlearning' the many preconceptions, using traditional tools and minute examination of the original that survives, are the keys to preserving this country's plastering heritage. Modern good practice is only a stepping stone in a trade rich in the unexpected. IAN CONSTANTINIDES founded St Blaise Ltd in 1977 after working as a materials scientist.